Nigeria is on fire with Muslim-inspired violence against Christians. Fulani herdsmen, suicide bomber ring in new year with violence in three states. JOS, Nigeria (Morning Star News) Muslim Fulani gunmen on Friday (Jan. 2) killed 15 Christians in an area of Kaduna state where 10 others were killed on Dec. 27, ending a week of violence in Nigeria in which at least 28 died. The ethnic Fulani herdsmen killed the 15 Christians in Ambe-Madaki village, in Kaduna’s Sanga Local Government Area, in an attack that began at about 4 a.m., sources said. On Dec. 27 in Tattaura village of the same area, Muslim Fulanis killed 10 Christians. In yesterday’s assault, the Muslim Fulani gunmen shot villagers and set fire to their houses, a local resident, Yohanna Adamu, told Morning Star News by phone. He said many other Christians remained missing, and scores of others sustained injuries. On New Year’s Eve in Plateau state, Muslim Fulani gunmen at about 8:30 a.m. attacked the Christian community of Kantoma, Mangu Local Government Area, killing three members of the Church of Christ in Nations (COCIN), residents told Morning Star News. Area resident Ulama Joseph said by phone that Muslim Fulani herdsmen carried out the attack as the Christians were preparing for New Year’s festivities. “The attackers came from a Muslim Fulani settlement around the area,” he said, adding that the assailants beheaded one of the three Christians killed, taking the head with them as they fled. 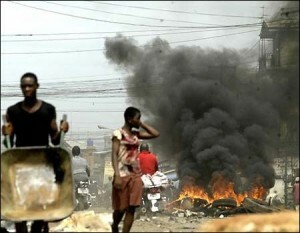 The assault has caused panic among area Christians, most of them COCIN members. Mark Lipdo, executive director of the Stefanos Foundation, said in a text message to Morning Star News that Christian residents of Kantoma village had sent him a distress call about Muslim Fulani gunmen shooting at them. Intervention by security agents helped reduce casualties, he said. Abu Emmanuel, a police spokesman for the Plateau State Command, confirmed the attack. The police spokesman said investigation into the attack had begun and urged residents to remain calm as security agents would provide protection. In the attack on Tattaura village in Sanga Local Government Area, Muslim Fulani gunmen on the night of Dec. 27 killed 10 Christians and wounded five others as the Christians were holding Christmas celebrations after 10 p.m., said Mike Maikarfi, one of the pastors of the Evangelical Reformed Church of Christ (ERCC). Maikarfi gave the names of those killed as Joel Ambo, Yakubu Ambi, Yamu Idzi, Anche Ishaku, Misalai Ngbo, Ishaya Anche, Monday Samson, Joel Anzah, Jonathan Anche and one known as P-Square. A villager who narrowly escaped told Morning Star News by phone that five others were wounded. The attack comes six months after a similar assault on Nandu Akpong village, near Tattaura; in that June 23 attack, 19 Christians were killed. A Tattaura community leader, Mike Sanga, told Morning Star News that those killed on Dec. 27 were buried on Monday (Dec. 29). “Muslim Fulani herdsmen carried out both attacks,” Sanga said. Another village resident, Thomas Adams, said Christmas celebrations in the area usually begin on Christmas Eve and last up to the first week of January. Festivities include singing carols in churches and outreaches in open fields, where worshippers give praises for the birth of Jesus Christ through song and dance. Kaduna State Police Commissioner Umar Shehu, confirmed the attack but said no arrests have been made. He added that soldiers and policemen have been drafted to the village to offer protection to survivors. In Gombe, capital of the state of the same name, a suicide bomber injured at least eight Christians guarding a New Year’s Day prayer service. Stationed at a security checkpoint located about the length of a football field from the Evangelical Church Winning All (ECWA) building, two of the injured Christians were seriously injured and underwent surgery at Gombe Specialist Hospital, an eyewitness told Morning Star News. “Two of the Christians are in critical condition and were taken into the hospital’s surgery theatre,” he said. Believed to be a member or sympathizer of the Islamic extremist group Boko Haram, which has seized 20 towns in three states bordering Gombe state, the suicide bomber on a motorcycle carried Improvised Explosive Devices that detonated as Christians were in the church praying. Gombe resident Joseph Kamida Cham, president of Urban Frontiers Mission, told Morning Star News that there are two other churches close to the ECWA building. In the tense atmosphere that churches in the northeast have seen in the past two years, the road had been closed to traffic as early as 5:30 a.m. for the service scheduled to begin 9 a.m., he said. Cham was leaving his home for the service when he saw and heard a loud explosion about 100 meters from the churches, he said. Most of those affected had only minor injuries, he said. Another native of Gombe confirmed the bomb attack, adding that the assailants began their activities on New Year’s Eve, when a female suicide bomber tried to attack the city’s military barracks. Soldiers reportedly fired on her when she refused to heed an order to stop, detonating the belt of explosives she had hidden under her covering. On the same day in neighboring Yobe state, in a village near Potiskum, an explosion on a bus killed seven people. Police in Gombe confirmed the explosion on the road to the ECWA church. Police spokesman Fwaje Atajiri said in a press statement that the suicide bomber rode on a motorcycle and tried to enter the church at about 9 a.m.
“He came with a motorcycle and tried to enter the place, but as a result of the security measures put in place, he was blocked and the bomb exploded instantly and he was killed,” the police spokesman said.